Darjeeling, Aug. 4: Bimal Gurung today asked his supporters to intensify the Gorkhaland statehood agitation and be ready to “face bullets”, alleging the state government’s intentions were “not good”. The Gorkha Janmukti Morcha president also appealed to war veterans to be ready to return their gallantry medals to the Centre as he took potshots at chief minister Mamata Banerjee. “The intention of Mamata, who has no mamata (tenderness) in her heart, is not good,” Gurung told a rally at Chowk Bazar in Darjeeling. He asked party supporters to carry out a sit-in demonstration in front of the district magistrate’s office tomorrow. With the renewed agitation hitting attendance in most government offices, the district administration warned that truant staff would be issued show-cause notices and face a break in service. District magistrate Saumitra Mohan, who has been attending office amid tight security, said the hydel projects forced shut by Morcha supporters yesterday had resumed generation. 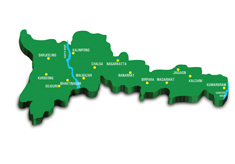 The Ramman and Nippon projects, about 90km from Darjeeling, have a combined capacity of 54MW. Gurung will be leaving for Kalimpong at 7am tomorrow to attend the funeral of Mangal Singh Rajput, a Morcha activist who died yesterday of burns suffered during a self-immolation bid on July 30. “We will have to pay our respects to this brave soul who sacrificed his life for the cause of Gorkhaland. Candlelight rallies will be organised throughout the hills this evening,” he said. Gurung later said he had already spoken to the ex-servicemen’s association, which is affiliated to the Morcha, and claimed the former soldiers were ready to surrender their medals at an appropriate time. The second day of the general strike was relatively peaceful although police sources said a jeep was burnt at Kalijhora, about 55km from Darjeeling, early this morning. Darjeeling’s Muslim community has decided to celebrate Id in a low-key manner in support of the Gorkhaland demand. “We have decided to refrain from organising any grand celebration to express solidarity (with the Gorkhaland agitators). We shall observe only religious rituals,” said Abdul Rashid Bhatt, secretary of the Anjuam-e-Islamia.